How to find attractive ideas to write about? Depending on the topic of your blog, it’s normal that at some point you run out of ideas about what to write about. How do you get to be consistent in writing? The day has come to publish a new post and you don’t have it ready. What has happened? Where have you failed? Frustration can lead you to abandon the blog. The promotion of the blog is an infernal task. After writing a post you still have all the promotional work left: log on to each social profile, copy and paste to promote on social networks… The day has only 24 hours! It’s the end of the day and you have the feeling that you couldn’t even start what you had planned… Does it sound familiar? Photo by tonybabel on Giphy. If you want to keep your blog successful, the key is to be efficient in the entire content generation process. In our case, it was this determination to get more efficiency that led us to create Nelio Content. What were we looking to solve? Are you having trouble generating ideas? Well, we do. That is why, when we had an idea, we had to write it down somewhere that would allow us to have it always available when we later had to think about what to write about. But where? Mail? Google Docs? Much simpler: on your own blog! 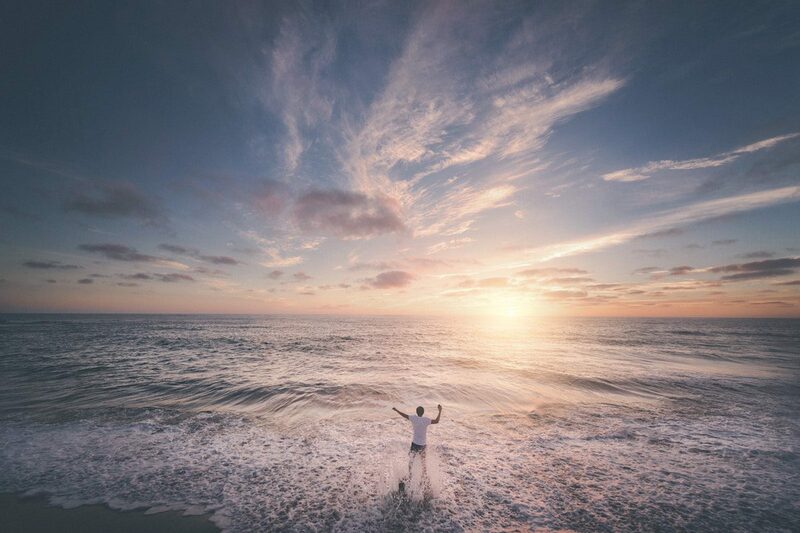 Nelio Content allows you to write down ideas about what to write in a list that you will always have available in your blog to convert them into future posts. Don’t forget to write down your ideas when you come up with them. This way, you’ll be much faster planning your editorial calendar posts for the month. #2 Oops! It’s my turn to write a new post; what can I write about today? Did you know that the biggest waste of time, what kills your productivity, is lack of planning? Take a look at the time you waste thinking about what to write about every time it’s time to publish something new. 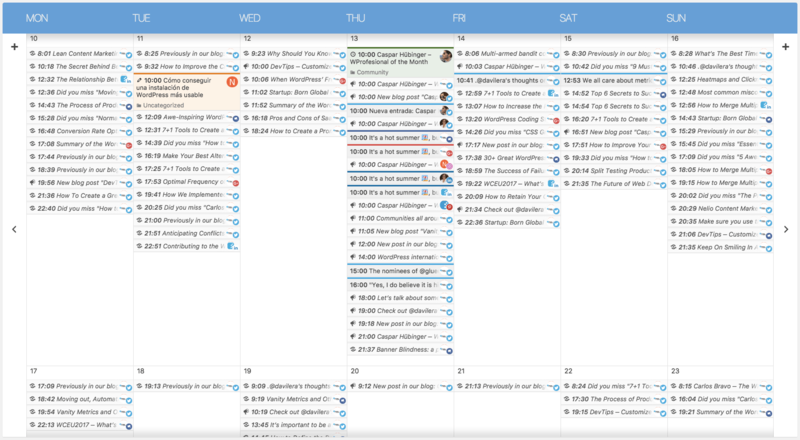 In a blog, controlling planning means having an editorial calendar in which you schedule the posts you’re going to write over the next month. So when you start writing, you just need to concentrate on that task. 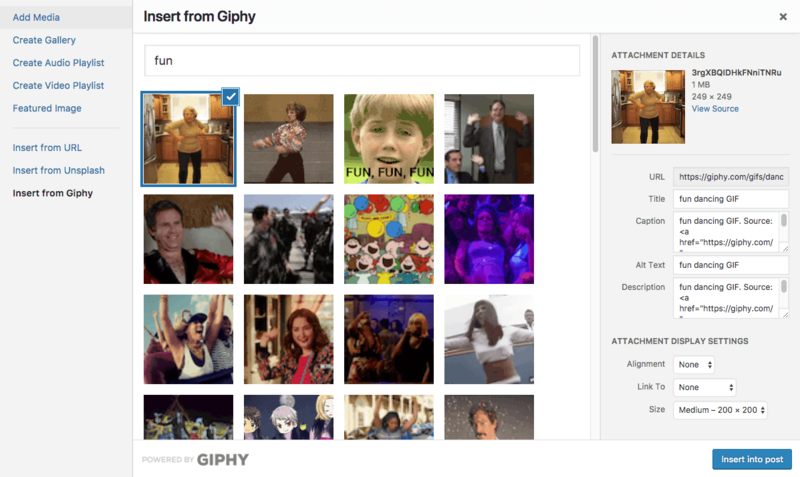 You know that all content is more attractive if you can include images or Gifs. But it’s hard to find that image on the Internet, download it and then upload it to WordPress. You have to be able to do it faster! You can also keep in mind that a post has to be complete: you should indicate its category and tags, insert a featured image, write an excerpt, include some internal or external links and complete some additional meta-information that may be useful for the SEO. A tool can’t do this work for you, but it can warn you when something is missing before you publish an incomplete post. Our recommendation to ensure a good level of quality in your content is to have a review process. We do not publish any posts on our blog without someone other than the author having read it first. In our case, this means that when you have just written the post, you have to tell another member of the team to proofread and schedule it. With Nelio Content, we do this by simply telling who to notify when the status of a post changes. In this way, when we change the status a post to “pending review”, the reviewer receives an automatic email with the notice and they know what to do. 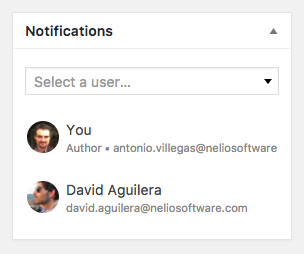 Nelio Content notification metabox, where you can add users interested in receiving notifications about a specific post. The automation of blog promotion on social networks is what has made the difference in our company: Nelio Content has considerably simplified our work! After writing a post and with a single click, Nelio Content is in charge of planning all your promotion on social networks. In other words, it automatically creates the queue of messages to be published in each of your social profiles without worrying about anything else. In addition, the promotion of new content is complemented with the re-sharing of old content from your blog. 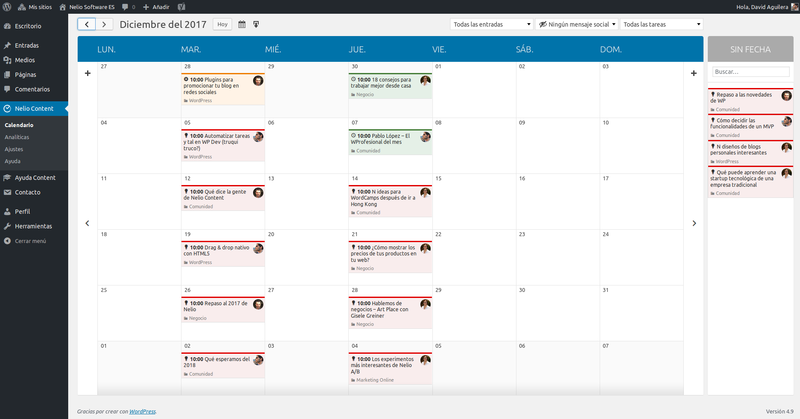 Thus, the editorial calendar is automatically filled with social messages that will give a second life to your best old posts. If you are interested in the topic, in this post I tell you how Nelio Content automatically generates all the messages that will be published on the networks using the content of your post and templates, even adding mentions on Twitter to increase dissemination. The time saving is amazing! #7 Is it working for me? In our case, we wanted to have just the strictly necessary information in the blog itself to know how the posts were working. We only wanted information to help us quickly identify what content is most successful. Social Media analytics with Nelio Content show you which posts have received the most visits and with a click on Add Message you can quickly create a new message to promote that post on social networks again. In the title of this post I had promised a surprise for you, didn’t I? Let me tell you about it. 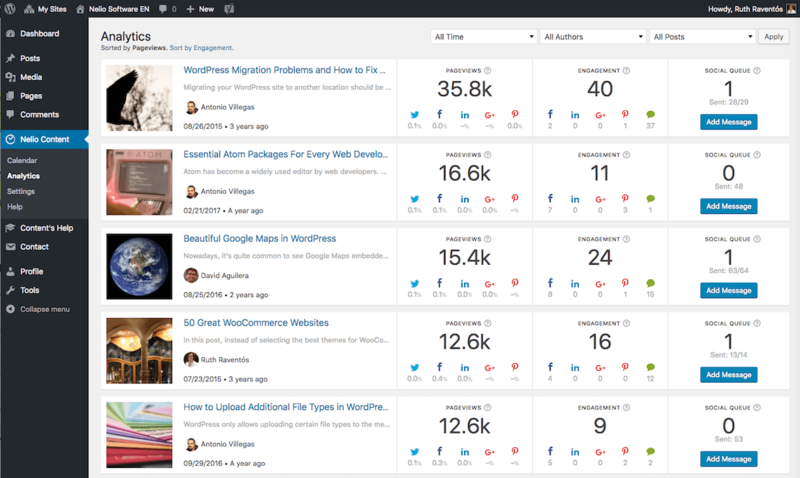 You probably know our tool because of its free version we’ve published in the WordPress.org plugins directory. A few days ago you could subscribe to a Nelio Content Personal plan, aimed at those who have a personal blog and work alone with their website, or to a Team plan, if you are a tema that want to work together and be coordinated. In addition, the different subscription plans could be complemented by an add-on, Social Automations, which enabled automatic blog promotion. After a detailed analysis of our customers, we saw that the best way to help them improve their website was to merge the Personal and Team plans into one. That is, to create a plan that had all the advantages of Nelio Content. Finally, we’ve opted for a single plan that includes all the functionalities and advantages of the Team plan with the Social Automations add-on. Take a good look, the Premium plan for teams that includes automatic generation of social messages for only 29€ per month. You used to have this plan for 99€ a month. A discount you shouldn’t miss! If you were subscribed to a Personal Plan, when you upgrade the plugin, you’ll have the Premium version, but we’ll keep your old price for life. You had bet on us and that’s how we want to thank you! If, on the other hand, you were subscribed to a plan with a higher price, it doesn’t make any sense that you can’t also take advantage of this great promotion. So, without you having to do anything, we’ll lower the price you pay for the service to match this new offer. So, what do you think of the big change? 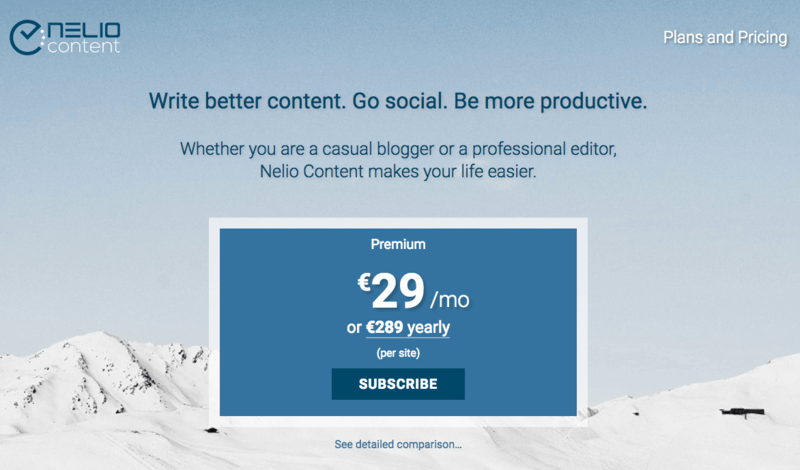 We think it’s worth it, because we want both the small blogger and the big company benefit from the advantages of Nelio Content. All of them. Sounds great. I hope this works out well for your company! I really appreciate you guys keeping the price the same for your early customers. This is amazing news! This decision should greatly reward your work and benefit many new and existing customers. By the way, I really appreciate this generous upgrade for your existing subscribers. I knew from the first time I interacted with the Nelio Team that you are a leader in serving customers. Thank you for all you do and for this news! Thanks, Gene for trusting us!! !